I had a good color plan going last year when I started planning this new wardrobe – black/charcoal, dark brown, blue-green, magenta/fuchsia, and bright white. But I’m going to make some changes. Over the last eight months, I have not worn any brown or magenta/fuchsia clothes. I only had a few but they did not get any wear at all as I had consistently picked other clothes to wear. So those two colors will have to go. I did, however, wear red and purple (not together!) so they will be joining this group. I did mention last time that the closet looked a bit sparse, didn’t I? I figure an hour or so of sewing time every day after work should yield a new garment every week or two. Then in a couple of months, I will be ready to add more colors. I sew for an hour a day and generally complete one new garment a week. Love your color plan and new garments. 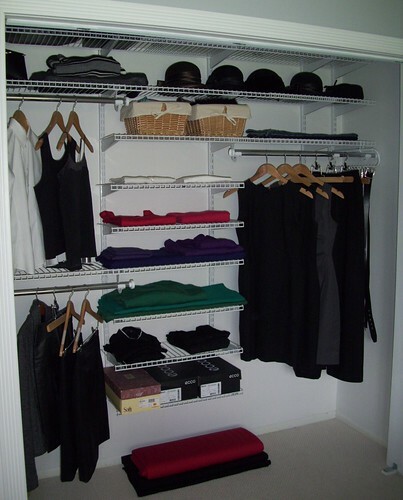 Did you find it difficult to originally cull your wardrobe? I’m pretty much facing the same thing in the near future. Hey Alexandra! I missed you! So glad to see you posting again. Both here and on SG. I’m glad to see that you’re adding more bright colors to your wardrobe. When I saw all the darks you were working with before, I couldn’t help thinking “she’s SO pretty, I bet she’d look great in lighter, brighter colors.” :-)Glad you’re using them. I like your new wardrobe plan and how the green gives it a punch of color! And I’m sure that as you devote more time to sewing the garments will just come rolling out of your sewing machine.